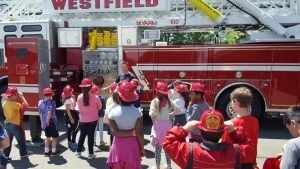 On June 8th students of Mrs. Byrnes’s and Miss Chase’s third grade classes from Moody Elementary School came to the Westfield Fire Department to wrap up the yearlong Adopt-a-Firefighter program put on by the Westfield Fire Marshal’s Office. The trip included a station tour as well as an up close look at the Department’s apparatus, tools and equipment carried by the firefighters. 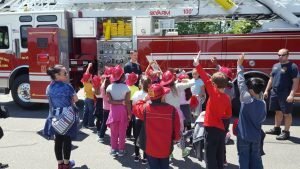 The Adopt-a-Firefighter program brings the District’s full time firefighters into the classroom once a month throughout the school year to talk to the third grade students about fire safety. The program is led by Deputy Fire Marshal, Scott Kotowski with support from Firefighters DiCostanzo, Lubee & Leary. The visits cover a range of potentially life-saving topics such as stop drop and roll, crawl low under smoke, and how to make a 911 emergency call. Students are also exposed on how to handle possible medical emergencies and get a lesson in “don’t fear the gear” so they won’t be scared should they encounter a firefighter in full turnout gear. The firefighters wish this year’s students the best of luck in the fourth grade, and look forward to meeting the incoming third grade classes.